Have a question about the Trident Aqua Optx Flexible Magnifier Bi-Focal Inserts? 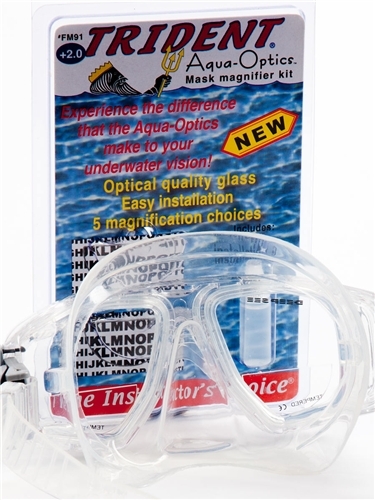 Aqua Optx Bi-Focal Flexible Gauge Reader Inserts are permanently installed with special clear glue that is included with each pair. Why spend $100 or more for ground lenses when you can have the readers installed in minutes. Perfect when your gauges just don't seem easy enough to read anymore, especially underwater. on 3/24/2011 I am desperate for these inserts for my husbands dive mask - he goes April 2 for his certification dive. I see that the 2.00 is back orderd till the 25th is there any way I can have them by Thursday the 31st? on 2/18/2012 I'd like to order Dive Optx Flexible Magnifier Bi-Focal Inserts in a 2.00 diopter. When can you guarantee shipment? I need by end of month. on 2/20/2012 Hello, we would be happy to take care of you but these are on back order until the end of the month and that is that we would be able to order them in not have them available to ship. So, I would not want to make a promise we could not keep. Sorry about that. on 3/13/2012 Hi There, Sorry the company moved and is not manufacturing at the moment. Could be a long while is what we are being told. on 3/13/2012 Hi Miguel,, Just got an answer finally from our supplier. The folks at this company moved production and as of today and the near future will not be making any. So, no stock for at least another 3 months or more. on 4/20/2012 I'd like to order a few pairs of these in 1.25 and 1.5 - are these special order items or are they really backordered until July??? on 4/20/2012 Hi There, These may be back ordered even later as that company moved and they are having issues with the new plant and getting production going. Sorry but no under our control,maybe we need to start making them!! on 10/22/2013 Sure you can as long at you don't already have bifocals? on 11/17/2017 Hello There... Can the glue used to adhere these lenses be used on removable lenses to keep them affixed for good? Wanted to use on back up mask.